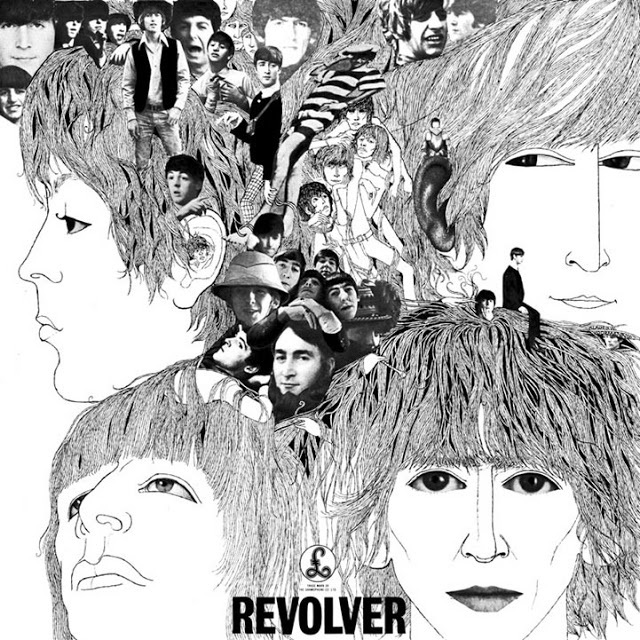 Revolver is the seventh studio album by the English rock band The Beatles, released on 5 August 1966 on the Parlophone label and produced by George Martin. 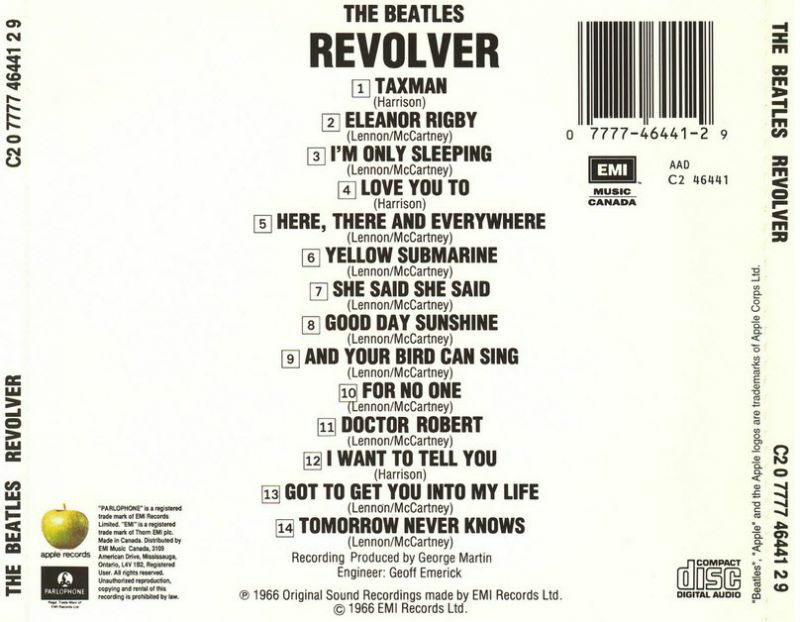 Many of the tracks on Revolver are marked by an electric guitar-rock sound, in contrast with their previous LP, the folk rock inspired Rubber Soul (1965). 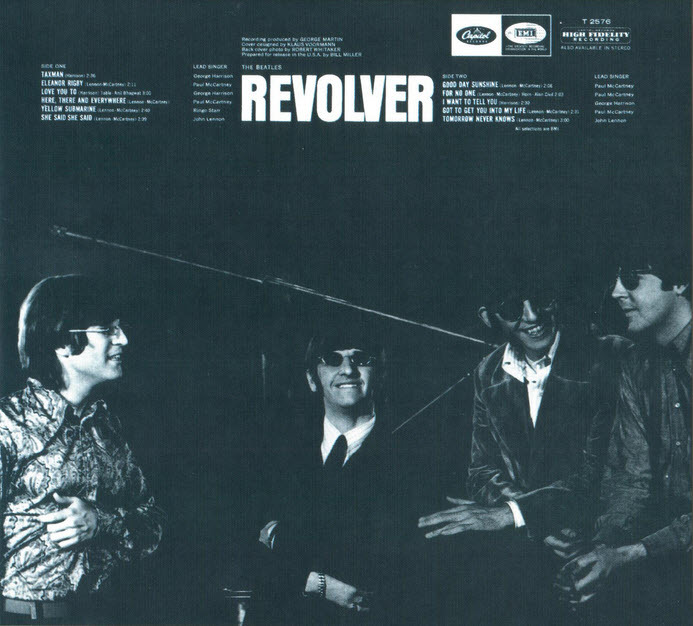 In Britain, the fourteen tracks from Revolver were released to radio stations throughout July 1966, “building anticipation for what would clearly be a radical new phase in the group’s recording career”. It reached number one on both the British chart and American chart and stayed at the top spot for seven weeks and six weeks, respectively. The album was remastered 9 September 2009 for the first time since its 1987 digital compact disc release. Placed at number 1 in the All-Time Top 1000 Albums and number 3 in the Rolling Stone magazine’s list of the 500 greatest albums of all time, the album is often regarded as one of the greatest achievements in music history and one of The Beatles’ greatest studio achievements. 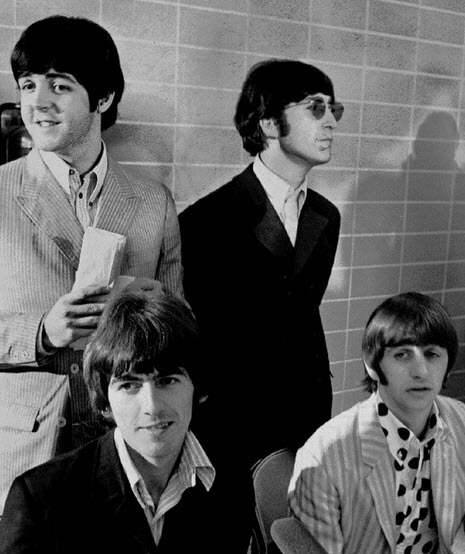 All the rules fell by the wayside with Revolver, as the Beatles began exploring new sonic territory, lyrical subjects, and styles of composition. It wasn’t just Lennon and McCartney, either — Harrison staked out his own dark territory with the tightly wound, cynical rocker “Taxman”; the jaunty yet dissonant “I Want to Tell You”; and “Love You To,” George’s first and best foray into Indian music. Such explorations were bold, yet they were eclipsed by Lennon’s trippy kaleidoscopes of sound. His most straightforward number was “Doctor Robert,” an ode to his dealer, and things just got stranger from there as he buried “And Your Bird Can Sing” in a maze of multi-tracked guitars, gave Ringo a charmingly hallucinogenic slice of childhood whimsy in “Yellow Submarine,” and then capped it off with a triptych of bad trips: the spiraling “She Said She Said”; the crawling, druggy “I’m Only Sleeping”; and “Tomorrow Never Knows,” a pure nightmare where John sang portions of the Tibetan Book of the Dead into a suspended microphone over Ringo’s thundering, menacing drumbeats and layers of overdubbed, phased guitars and tape loops…. In 1997, it was named the third greatest album of all time in a Music of the Millennium poll conducted in the United Kingdom by HMV Group, Channel 4, The Guardian and Classic FM. In 2000, Q magazine placed it at number 1 in its list of the 100 Greatest British Albums Ever. In 2001, the TV network VH1 named it the number 1 greatest album of all time, a position it also achieved in the Virgin All Time Top 1,000 Albums. In 2002, the readers of Rolling Stone ranked the album the greatest of all time. In 2006, Guitar World readers chose it as the 10th best guitar album of all time. In 2007, a PopMatters review described the album’s content – “the individual members of the greatest band in the history of pop music peaking at the exact same time”. In 2012, Revolver was voted 3rd on Rolling Stone magazine’s list of the “500 Greatest Albums of All Time”. It placed behind only the Beatles’ own Sgt. Pepper’s Lonely Hearts Club Band and The Beach Boys’ Pet Sounds. Revolver currently holds the number 3 spot on Rate Your Music’s top 1000 albums chart.